Big! 8.5″ x 11″ Glossy, 285 Pages of Tried, True,And Innovative Facts For Trail Riders, Packers, And General Horse Owners. More Than 450 ‘How To” Photographs on Training, Horses, Horsemanship, Hitches, Knots, Riding, Packing, Gear, Technique, and Camping. The #1 Selling Horse Book In Many Stores! …we sold nineteen copies……many of our customers enjoy going to the mountains and have used it as a resource……an excellent book and we’ll keep it stocked for our trail riding enthusiasts…. Stan Walchuk Jr. is your chief partner in learning. Stan has travelled literally thousands of wilderness miles in remote areas of North America, including the amazing ‘Cordillera! Expedition.’ He is a biologist, teacher, award winning filmaker, and writer. 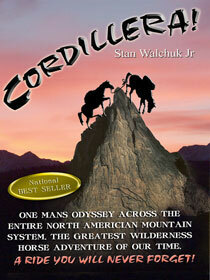 Stan is the author of Blue Creeks Trail riding, Packing and Training, and Cordillera! (see Blue creeks home page). He has written many articles for equine magazines and write a monthly coumn in the Pacific and Prairie Horse. Stan is a member of the Longriders Guild (www.thelongridersguild.com). 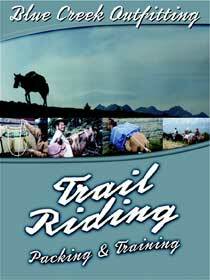 The Most Complete Trail Riding and Packing DVD Ever – Guaranteed! Designed for all Trail Riders And Packers. Methods From Across the USA and Canada. 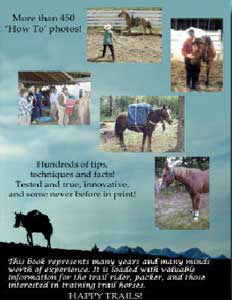 This DVD is unique in that it has been primarily filmed on the trail, over several years, with help and film contributions from various trail riders, many who have taken the Blue Creek clinic and used Blue Creek horses. It has literally hundreds of facts, methods, tips, thoughts and techniques, gathered from many riders, guides and outfitters over the years. Although it is interactive – you can pick the section you want to watch – it moves quickly and is entertaining. A sequel called ‘Camping With Horses’ is expected in the coming year and trail riders are welcome to submit ideas/suggestions for further content, and video footage would be appreciated. I loved the trail riding and horse packing dvd, great shots, very informative, easy to follow…loved the songs in between as well. Can’t wait to grab some horses next summer and do my next trip… Donat Koller, Salmon Arm, B.C. I am a former endurance racer who has fallen in love with the slower pace and scenery of trail riding. I recently watched the dvd and it is unique in that no other videos out there are as comprehensive in all aspects of safety, wrangling, gear, tips, knots and hitches, packing and horse conformation. For me the most pertinent unit was about The Right Horse because it was not just about the right conformation but the mentality that is needed from the horse for the trail rider. The trail safety module was also extremely thorough and full of useful tips that could save one in the back country…’ Erin Gunoff, Vernon, B.C. As a keen trail rider I used your Blue Creek Trail Riding, Training, and Packing Book for several years to train my trail horses. So I was excited to see what you had cooked up in the new DVD – and the DVD delivered the goods. It was informative, easy to watch, and humorous, all at the same time. A great DVD to learn the ropes (literally)! Tania Millen, Terrace, B.C. An awesome video for riders of all levels. It was a truly a well thought out and planned video with breathtaking scenes to go along with it…now I have the luxury of reviewing those important concepts before hitting the trail…Thank you Stan and Marlene. Jane Dyck, Kamloops, B.C. Three men set out from the northern plains of North America with pack and saddle horses in an attempt to reach the Pacific Ocean. Twelve hundred wilderness miles, eleven mountain ranges, and wenty two rives crossing later, only one of them reached Wrangell, Alaska. This is the facinating account of the incredible journey. It was one of the longest, most rugged wilderness journeys ever – A truly great adventure of our time – A truly great film! Filmed while on the actual journey. 1200 wilderness miles! The Hardships And the Joys, The Trail Life And The Incredible Beauty Of Remote Mountain Wilderness. Like The Book, This Movie Is A Very Memorable Experience. Stan Walchuk Jr. is your chief partner in learning. Stan has travelled literally thousands of wilderness miles in remote areas of North America, including the amazing ‘Cordillera! Expedition.’ He is a biologist, teacher, award winning filmaker, and writer. 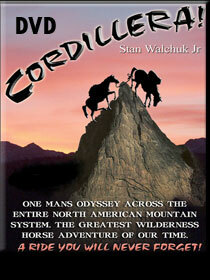 Stan is the author of Blue Creeks Trail riding, Packing and Training, and Cordillera! (also available on this website). He has written many articles for equine magazines and write a monthly column in the Pacific and Prairie Horse. Stan is a member of the Longriders Guild (www.thelongridersguild.com). Twelve hundred wilderness miles, eleven mountain ranges, and wenty two river crossings later, only one of them reached Wrangell, Alaska. This is the facinating account of the incredible journey. It was one of the longest, most rugged wilderness journeys ever – A truly great adventure of our time – A truly great book! The Greatest Wilderness Horse Journey of Our Time. Stan Walchuk Jr. is your chief partner in learning. Stan has travelled literally thousands of wilderness miles in remote areas of North America, including the amazing ‘Cordillera! Expedition.’ He is a biologist, teacher, award winning filmaker, and writer. Stan is the author of Blue Creeks Trail riding, Packing and Training, and Cordillera! (available on this website). He has written many articles for equine magazines and write a monthly coumn in the Pacific and Prairie Horse. Stan is a member of the Longriders Guild (www.thelongridersguild.com). © 2019 Pack Horse. All Rights Reserved.